This article is about the Seattle neighborhood. For urban park of the same name, see Seward Park (Seattle). 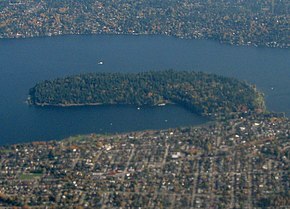 Aerial view of Seward Park area from the west featuring forested Bailey Peninsula in Lake Washington, with Mercer Island on top. Seward Park is a neighborhood in southeast Seattle, Washington just west of the park of the same name. It is part of Seattle's South End. The park itself occupies all of Bailey Peninsula, which juts into Lake Washington. The attached map is accurate, broadly speaking, in capturing "Greater Seward Park," though real estate sites, such as Zillow, will refer to the part of the neighborhood north of Orcas Street as Lakewood, which is reasonable, since that neighborhood is the historic home of a "community club" (which owns its own house and land) once known as the Lakewood Community Club (built on or around the 1920s), and now known as the Lakewood-Seward Community Club. The neighborhood is bounded on the east and north by Lake Washington, on the south by South Kenyon Street, and on the west by the eastern boundaries of Columbia City, one of Seattle's oldest neighborhoods. Because, as the city of Seattle proudly notes, Seattle does not believe in wards, wishing to avoid the "ward politics of 'back East'" (that would be Chicago and eastward), Seattle has no legally defined neighborhoods, though it now indeed has seven "wards." However, the city does respond to popular definitions, as does Zillow, and the city's website indicates how complex the west border of the Seward Park (or Lakewood-Seward Park) neighborhood is. The 300 acres (121 ha) of Seward Park has about a 120 acre (48.6 ha) surviving remnant of old growth forest, providing a glimpse of what some of the lake shore looked like before the growth of the city of Seattle. With trees older than 250 years, the Seward Park forest is relatively young (the forests of Seattle before the city were fully mature, up to 1,000–2,000 years old). Still, there is no other forest within the city limits like Seward Park's. You can wander trails where all you can see are towering softwoods, mostly Douglas firs, but with other species present as well, including Western hemlock, Pacific madrona and Alaskan cedar. The Park offers at least five distinct experiences, which are further described under the entry for the park itself. One of the earliest settlers, E. A. Clark, was influential in the life of Cheshiahud, a young man at the time, the mid-1850s. The Seward Park neighborhood includes what may be one of the highest residential hills in Seattle (the hill is traversed by Graham Street near its high point, thus earning it the name "Graham hill"). In a series of annexations, the neighborhood joined the City of Seattle in 1907. Around a quarter of the residents are African American, and another quarter Asian American, with a sizable portion of the 50% white population being Jewish. The neighborhood has been a hub of Orthodox Jewish life for nearly 40 years. The oldest synagogue in Washington state, Bikur Cholim Machzikay Hadath, is located there, as are Minyan Ohr Chadash, Ashreichem Yisrael, Sephardic Congregation Ezra Bessaroth, and Sephardic Bikur Holim Congregation. Up to 90% of Orthodox Jews in Seattle are said to live within a mile of one of the synagogues, though recent arrivals have also settled north of the Lake Washington Ship Canal in View Ridge, Wedgwood, Hawthorne Hills, and Ravenna and in nearby communities such as Mercer Island. The neighborhood has at least two Christian churches (one near the Lakewood playground, the other near Orcas Street and Wilson Avenue) and is part of the large, diverse Roman Catholic parish of St. Edward, which some residents either belong to or financially support its K-8 school. Although no schools fall within the borders of the neighborhood as described on city maps, three public schools, Graham Hill and Hawthorne and Dunlap elementary schools serve the area's students. In addition the alternative Orca K-8 lies within blocks of the neighborhood's boundary. ^ "Seattle City Clerk's Office Geographic Indexing Atlas". ^ Sherwood, Don (2003-06-20). "Seward Park" (PDF). PARK HISTORY: Sherwood History Files. Seattle Parks and Recreation. Retrieved 2006-04-21. ^ Talbert, Paul (2006-05-01). "The Magnificent Forest". Friends of Seward Park. Archived from the original on 2006-07-17. Retrieved 2006-08-06. ^ Talbert, Paul (2006-05-01). "SkEba'kst: The Lake People and Seward Park". The History of Seward Park. SewardPark.org. Archived from the original on 2005-12-14. Retrieved 2006-06-06. ^ Phelps, Myra L. (1978). "Chapter 15, "Annexation"". Public works in Seattle. Seattle: Seattle Engineering Department. ISBN 0-9601928-1-6. , p. 216–224, map "to 1921", p. 217; map "to 1975", p. 224, map key table p. 222-3. ^ "Graham Hill Elementary School (which abuts the neighborhood as defined by the Clerk of the City of Seattle)" (PDF). 2014-15 attendance area maps. Seattle Public Schools. Archived (PDF) from the original on May 1, 2014. Retrieved May 1, 2014. ^ "Hawthorne Elementary School" (PDF). 2014-15 attendance area maps. Seattle Public Schools. Archived (PDF) from the original on May 1, 2014. Retrieved May 1, 2014. ^ "Dunlap Elementary School" (PDF). 2014-15 attendance area maps. Seattle Public Schools. Archived (PDF) from the original on May 1, 2014. Retrieved May 1, 2014. ^ "Orca K-8" (PDF). 2014-15 option elementary geo zones. Seattle Public Schools. Archived (PDF) from the original on May 1, 2014. Retrieved May 1, 2014. Dailey, Tom (n.d.). "Duwamish-Seattle". "Coast Salish Villages of Puget Sound". Retrieved 2006-04-21. External link in |work= (help). Page links to Village Descriptions Duwamish-Seattle section. Wilma, David (2001-03-31). "Seattle Neighborhoods: Seward Park -- Thumbnail History". HistoryLink.org Essay 3143. Retrieved 2006-08-06. Wikimedia Commons has media related to Seward Park, Seattle, Washington. "Lakewood Seward Park Community Club". This page was last edited on 5 March 2019, at 23:34 (UTC).